Boomerang Day Trader is literally revolutionizing the day trading industry with its extreme, precision accuracy and simplicity. If you are a futures day trader I highly enourage you to look into Boomerang Day Trader and start making simple, easy to understand, steady winning trades. You can attend our free webinars and learn all the method/rules of BDT before you purchase. And in our monthly “Recap of the Trade Setups” webinar I show you trade by trade how BDT handled the ENTIRE MONTH. Ask yourself…How many system vendors or indicator sales men out there will show you the entire month of their trades along with the exact rules/methods used to produce those trades…before you buy? Honestly, I haven’t found any. Sure they invite you to sit in some boring trading room but are you aware of the futures trading room stats? They may surprise you. There are over 425 futures trading rooms out there and according to a recent study only 5 of them showed any true promise. That is not a very good “track record” for so called trading rooms. And remember: you have to sit there all day in that room and wait for the room manager to give you trades that you HOPE will work out. Don’t forget… they are expensive also. Now with Boomerang Day Trader you can start your career as a futures day trader for just $1195 to purchase Boomerang and the cost of the NinjaTrader program which is minor. Then you are on your way to “Letting the Market be your Trading Room” and genuinely learn to trade with my FREE ON GOING TRAINING. 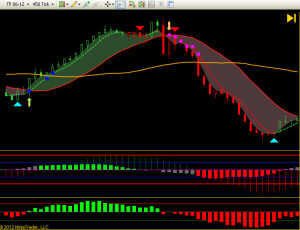 Check out today’s Video Tutorial training showing 11 winning trades in a row this weeks Tuesday and Wednesday. THERE WERE NO LOSS TRADES according to our exact method/rules. If you traded just 4NQ contracts 11 trades would have produced $2640 (minus commissions). Be sure to view our entire library of Video Tutorials shown on this link above. You have seen my messages here on Boomerang Day Trader along with all the excellent testimonials we get daily. You have seen our Track Record of Trading Setups showing a steady 80%+ winning ratio. And you have probably noticed our track record on a monthly basis showing our results converted to cash being over +$20,000 + a month. In addition to that our ON GOING FREE TRAINING is worth thousands of dollars…but I never charge one single penny to traders. Wishing you all the best of success at trading.